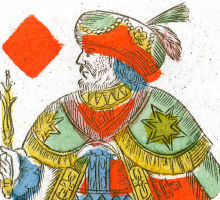 Above: playing cards were often featured in moralistic or satirical allegories, showing how they were rapidly absorbed into the popular imagination. 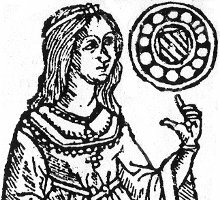 The repertoire of motifs employed in playing cards had long been in development in other applied crafts. 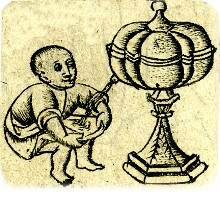 The craftsmen's tradition throughout the medieval period was to work from sketch-book models, collected on scraps of vellum. These models were copied time after time, so that images spread between workshops and from master to pupil. Images acquired during journeys abroad often contained errors of observation and proportion which were compounded by subsequent copying. 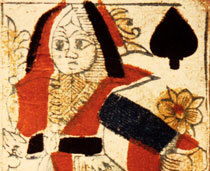 Whilst the main court card hierarchy was inspired by the social structure at court, and early suit systems were often associated with the hunt, much secondary imagery on early playing cards resembles the figures which recur in the borders and marginal drollery, miniature illustrations and trompe l'oeil of illuminated manuscripts or in tapestry, carving or sculpture. Often the theme was a playful allusion to tournaments, cavorting children or mock warfare between animals, frequently surrounded by fruits, flowers, acanthus leaves, birds, monkeys and grotesques. 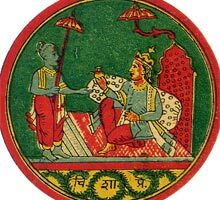 Cards were produced by artisans whose main source of income might not necessarily have been playing cards. Abilities varied: where lesser artists represented the stock subjects in a stereotyped way, others were able to visualise scenes afresh. Designs would also have been influenced by written texts, books on hunting, mystery plays and moralised stories. Plants from the herbal, beasts from the bestiary, birds and insects from the Books of Hours, all suggesting a symbolism, a semiotic language, echoed the everyday world of popular beliefs and folklore. 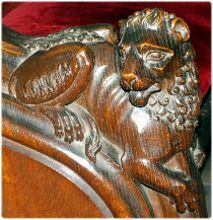 Above: Lion motif on XIV century choir stall; 9 of lions and 3 of herons engraved by the Master of the Playing Cards, c.1450-60. 137 x 91 mm. The central lion has also been identified as an illustration in the 42-line Bible of Mainz printed by Gutenberg, around 1454/55. Herons occur in the borders of a number of manuscripts and early printed books. 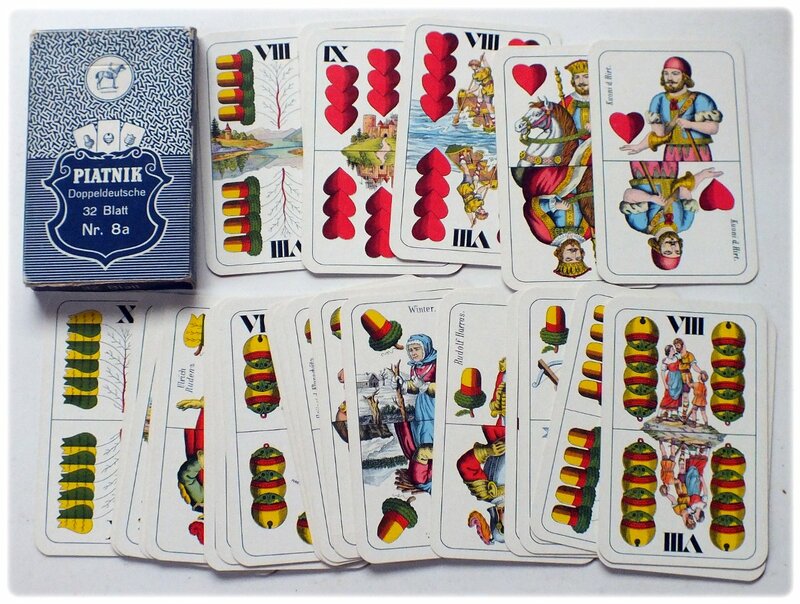 See also: South German Spanish-suited engraved playing cards • Master PW Circular Playing Cards. spades, hearts, clubs and diamonds were invented later. 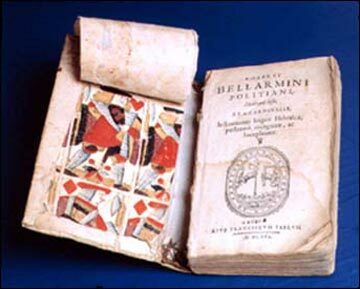 Many early examples of playing cards were preserved inside the covers of old books, where they were used as stiffener. This is fortunate, because nearly all the others have perished. With the onset of the Renaissance in Italy, the new spirit of Humanism was spreading through Europe bringing a change of form and direction. 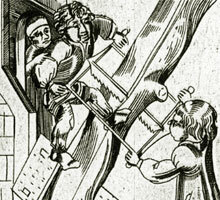 The Middle Ages had given birth to the dawn of the modern era. 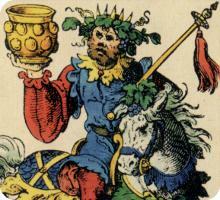 The style and thematic content of playing cards reflected the new world view. This new influence did not reach certain parts of Europe until the high and late Renaissance in the 16th century. Following in the wake of Italian art, the German Renaissance developed a new form of medieval knightly culture. 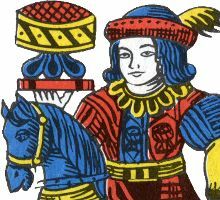 Imaginative decks of playing cards were produced by Jost Amman, Schäufelein, Schön and Peter Flötner. Artists were commissioned to paint anything from wall frescoes through Books of Hours to illuminated playing cards, thereby exhibiting the taste and cultivation of the patron. 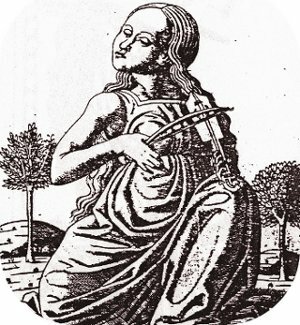 In some cases the imagery had a moral, Christian, instructional or philosophical content, whilst in other cases it was based upon popular culture, often satirical or else merely conventional or adorned with the owner's heraldic devices. 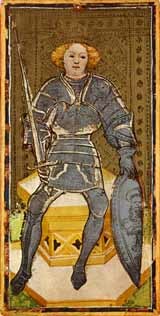 Left: Visconti tarocchi playing card, Milan, Italy, c.1445. Click here to see more. 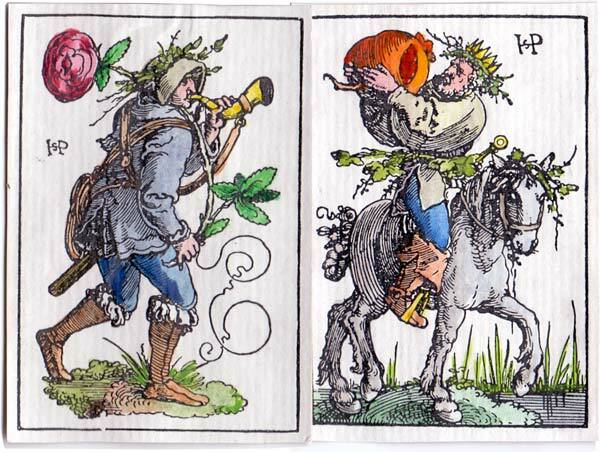 See also: Mantegna Tarocchi - Peter Flötner - Guildhall Library Tarot cards. 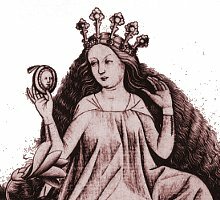 Download article about Origins of Imagery in the Tarot. By around 1500 three main suit systems had evolved: Latin (including Italian, Spanish and Portuguese); Germanic (German and Swiss) and French (which has become the International or 'Anglo-American' suit system). 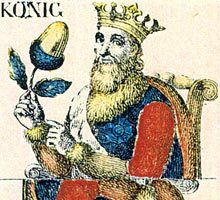 At the same time the court hierarchies were becoming standardised, although distinctive for different regions. Some of the suit symbols may have had a semi-symbolic significance (e.g. cups, coins, hearts, batons, pomegranates) or were adapted from a different language, others a reflection of popular culture at the time; but some students like to see a religious, social or political meaning in the symbols. These suit systems and court hierarchies became the basis for various Standard National patterns, or National Types, which were associated with specific regions or tax jurisdictions. Many of these have remained unchanged for centuries, being handed down through the generations, preserving their archaic, medieval characteristics. Others have evolved into modern types, perhaps as a self-affirmation of national identity in countries which have recently regained independence from imperial rule (see example). 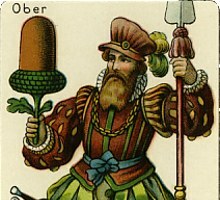 Indeed, as a result of globalisation and use of computers, standard playing card designs are becoming more uniform on the one hand, but with greater opportunities for customisation or originality on the other hand (i.e. non-standard).